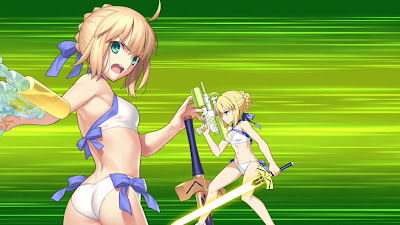 Fate/GO: Summer! The Sea! Half a Dozen Servants I Can't Whale For! 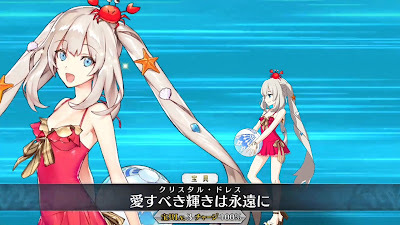 So straight up, the summer event in FGO is the one I've been most looking forward to over the last few months. I only knew a bit about it, but what I saw was a really creative interpretation of the usual item farming moves. I still didn't quite have a handle on where it (the first part, anyway) was going until I was actually playing it. It's... a typical harem beach episode, really. The player, Mash, and a whole bunch of Servants end up on a desert island with no way to contact Chaldea. The Servants are fine since they don't really have human needs, but there's you to worry about. 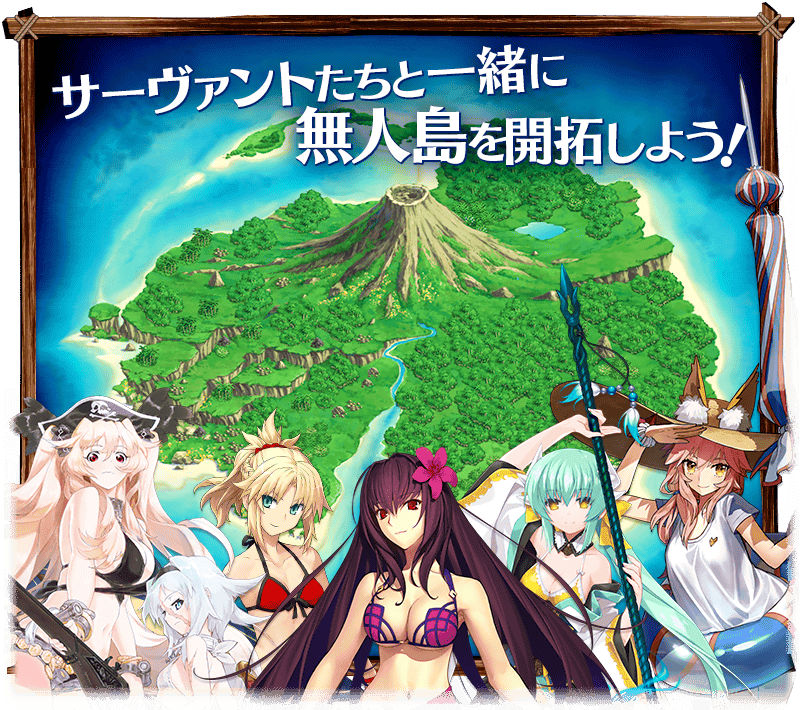 So, with the help of Scathach and her runes, you and your Heroic Spirits gather resources, battle monsters, and build a new life for yourself on your little island. Oh, and everyone's in bikinis because that's how it is. The campaign started literally yesterday and will run in two parts. From what I understand (I'm actually attempting not to read too much about Part II), there will be different drops and different Servants once the second part kicks in. The first is all about constructing your island home. And so far I'm liking it while also being... a little?... stressed? In the first half of the campaign there are five resources (which also serve as currency) available to you: food, fresh water, lumber, stone, and iron. And besides your main base, there are four regions — caves, jungle, grasslands, and beach — where these items are dropped with varying frequency. Good so far, right? Now, as with other campaigns, certain Servants give you a bonus to certain drops. For example, in the recently Momotaro campaign, all Servants of Japanese origin gave a bonus. Fairly straightforward, right? And fortunately, they tend to have characters across the board, so if you don't have any 5-stars, you're not out of luck. For the summer campaign, every Servant offers a bonus to one of the resources. Every. Single. One. This is good because it means no one is out of luck because the spread is so wide. But it also means I have to keep a guide open in a browser window. I eventually just saved five new formations (Food, Water, Lumber, Iron, Stone) with bonus-offering lowbie Servants backloaded into the Support positions. It's literally the only way my sieve-brain is going to remember to keep bonuses on until I get some Craft Essences. I enjoy the conceit of your collectibles actually having plot relevance... the idea of having to go out and gather wood and fresh water is interesting. At the same time, it makes me absolutely terrified to buy anything in the shop right now because I don't know when I'll want to make something very specific. I'm not sure yet if these different choices affect anything, or if it's simply aesthetic choice. I do know you can "reset" later on and rebuild it. Either way, it's an interesting... albeit occasionally very slow... mechanic. Fortunately, it looks like we're going to get some occasional shipwrecks to loot and move things along. 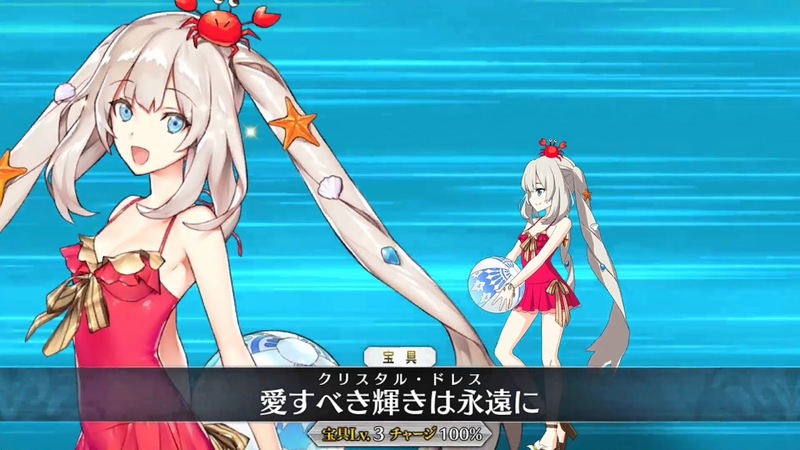 Naturally with a summer island/beach story comes swimsuits everywhere. And this means more limited versions of familiar Servants... including class changes, of course. 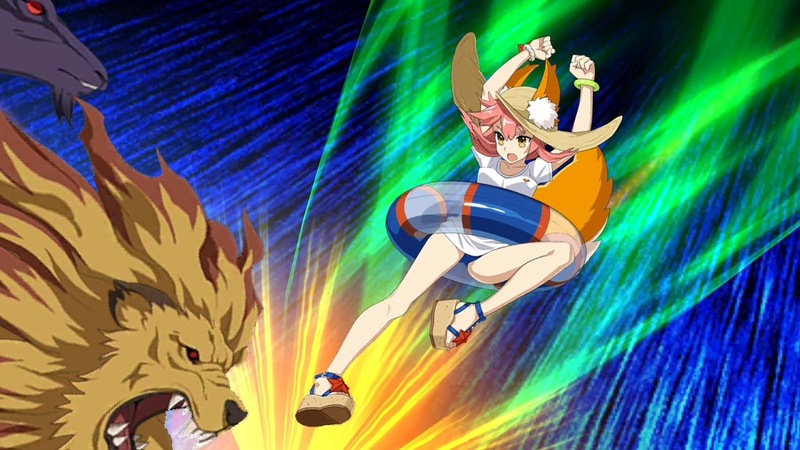 The new looks include (but aren't limited to) Archer Altria with a super soaker, Ruler Martha in a very posh sun hat, Lancer Tamamo with a floaty and T-shirt, and Lancer Kiyohime who's otherwise just as nuts as usual. Those you all have to roll for and hope for the best. But there's also one to earn — temporarily by the end of Part I, permanently by the end of Part II. The Assassin look for Scathach is pretty neat, and she's pretty much the one new Servant we haven't had an opportunity to test out. Likely on purpose. 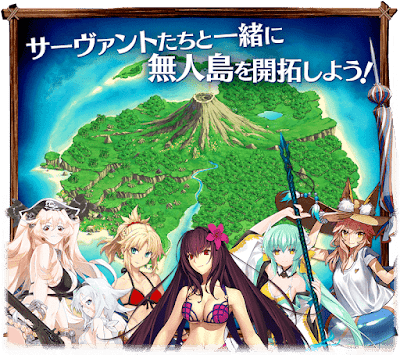 I've pretty much just contented myself with the fact that I'll have Scathach at the end of this, and I'm not putting any sort of emotional investment in earning a surfer Mo-san or a Marie Antoinette with an adorable baby crab on her head. The human heart can only withstand so much. Very Good Arthuriana... But Why? Since I'm me, I'll always appreciate extra effort put into representing the Arthurian side of FGO. I mean, it's obvious it'll be there once in a while — considering Altria Pendragon was a central character in its first iteration, it's sort of a thing. Barely in (it's only been a day, after all), and I've already seen a lot of dips back into discussion of Altria's life as King Arthur and her time at Camelot. And sure, one of those instances was because I took her advice and made my cabin out of stone. But with both Altria and Mordred on hand, we get a lot of talk about the legends' imagery and the billions of named things. Arthur's dog and horses get a name check, as does his boat, Prydwin (which ends up becoming Mordred's surfboard in her new Noble Phantasm). As for Altria's NP, "Excalibur Viviaine" takes its name from the Lady of the Lake. Okay yes good Kara. Lots of Arthurian stuff in Fate, well spotted. What does it matter? At the moment, quite a lot. In the main storyline, we're smack in the middle of the Sixth Singularity: Camelot. Or, rather, the time of the Crusades, overrun by an alternate Round Table. At the forefront is an alternate Altria, one who wields the spear Rhongomyniad rather than the sword Excalibur, and who expects some high-end purity and loyalty from her knights and subjects. Events are rarely integral to the main storyline, though you'll see references to them creep into your dialogue options. They also serve as a way to "soft-launch" Servants, like Florence Nightingale in the Count of Monte Cristo event. That said, the special events do have a sort of second level of continuity to them, and do feed into the main story. So something tells me it's not just casual Arthurian fanservice causing all these references. I suppose we'll find out when the second event rolls around. So far... yet another different event, and I'm enjoying it so far. I suppose by the time I'm in the swing of designing my island, it'll be time to switch to Part II. But I like the style, the sense of humor, and the amount of choice (regardless of how on-rails I still am) in this particular event so far. I'll check back in for Part II.